Leather Honey - Small Leather Care Bundle BUNDLE CONTAINS Half-Pint (32oz) Leather Conditioner, Concentrated (4oz makes 32oz) Leather Cleaner, 2x Lint-Free Application Cloth. 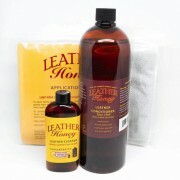 LEATHER CONDITIONER Leather Honey Leather Conditioner is a non-toxic, all-natural leather conditioner designed to inf..
Leather Honey - Small Leather Care Bundle BUNDLE CONTAINS Half-Pint (8oz) Leather Conditioner, Concentrated (4oz makes 32oz) Leather Cleaner, 2x Lint-Free Application Cloth. 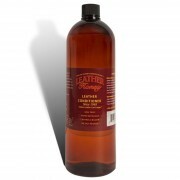 LEATHER CONDITIONER Leather Honey Leather Conditioner is a non-toxic, all-natural leather conditioner designed to infu..
Leather Honey Leather Cleaner For over 30 years, Leather Honey customers have trusted the Leather Honey name to help them restore and maintain their leather. Recently, many have expressed a desire for a non-toxic leather cleaner to coordinate with our leather conditioner. 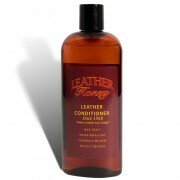 This is what inspired th..
Leather Honey Leather Conditioner 236ml Size: 236ml, 473ml, 946ml Leather Honey Leather Conditioner is a non-toxic, all-natural leather conditioner designed to infuse leather with necessary moisture. 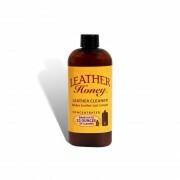 Leather is a natural material, and as such it requires frequent hydration to stay beautiful an..
Leather Honey Leather Conditioner 473ml Size: 236ml, 473ml, 946ml Leather Honey Leather Conditioner is a non-toxic, all-natural leather conditioner designed to infuse leather with necessary moisture. 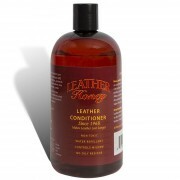 Leather is a natural material, and as such it requires frequent hydration to stay beautiful an..
Leather Honey Leather Conditioner 946ml Size: 236ml, 473ml, 946ml Leather Honey Leather Conditioner is a non-toxic, all-natural leather conditioner designed to infuse leather with necessary moisture. Leather is a natural material, and as such it requires frequent hydration to stay beautiful an..